References to Secondipity herein refer to Secondipity.com, a marketplace owned by Liquidity Services, Inc. (“LSI”), a Delaware corporation. By using the Secondipity Web site, you expressly agree that use of the Secondipity Web site is at your sole risk. The Secondipity Web site is provided on an "AS IS" and "as available" basis. Neither Secondipity nor its parent company, affiliates, subsidiaries or designees nor each of their respective officers, directors, employees, agents, third-party content providers, designers, contractors, distributors, merchants, sponsors, licensors or the like (collectively, "Associates") warrant that use of the Secondipity Web site will be uninterrupted or error-free. Neither LSI nor Secondipity nor their Associates warrant the accuracy, integrity or completeness of the content provided on the Secondipity Web site or the products or services offered for sale on the Secondipity Web site. Further, neither LSI nor Secondipity makes any representation that content provided on the Secondipity Web site is applicable to, or appropriate for use in, locations outside of the United States. LSI, Secondipity and their Associates warrant that all certain merchandise sold on the Secondipity Web site may contain a limited warranty of merchantability and fitness for ordinary purpose, but that such warranty is disclaimed for any product in which the warranty is not proclaimed in the product description. Additionally, LSI warrants that it has title to the goods being sold or is authorized by the record title holder to sell the goods, and that they are free of any liens or other encumbrances. LSI disclaims any warranty of fitness for a particular purpose. No oral advice or written information given by LSI, Secondipity or their Associates shall create a warranty. Some states do not allow the exclusion or limitation of certain warranties, so the above limitation or exclusion may not apply to you. Under no circumstances shall LSI, Secondipity or their Associates be liable for any direct, indirect, incidental, special or consequential damages that result from your use of or inability to use the Secondipity Web site, including but not limited to reliance by you on any information obtained from the Secondipity Web site that results in mistakes, omissions, interruptions, deletion or corruption of files, viruses, delays in operation or transmission, or any failure of performance. The foregoing Limitation of Liability shall apply in any action, whether in contract, tort or any other claim, even if an authorized representative of LSI or Secondipity has been advised of or should have knowledge of the possibility of such damages. User hereby acknowledges that this paragraph shall apply to all content, merchandise and services available through the Secondipity Web site. Some states do not allow the exclusion or limitation of incidental or consequential damages, so the above limitation or exclusion may not apply to you. The Secondipity Web site is intended for use by individuals 18 years of age or older. The Secondipity Web site is not directed for use by children under the age of 18. Users under the age of 18 should get the assistance of a parent or guardian to use this site. The Secondipity Web site attempts to display product images shown on the site as accurately as possible. However, we cannot guarantee that the color you see matches the product color, as the display of the color depends, in part, upon the monitor you are using. Prices and availability of products and services are subject to change without notice. Errors will be corrected where discovered, and Secondipity reserves the right to revoke any stated offer and to correct any errors, inaccuracies or omissions including after an order has been submitted and whether or not the order has been confirmed and your credit card charged. If your credit card has already been charged for the purchase and your order is canceled, Secondipity will issue a credit to your credit card account in the amount of the charge. Individual bank policies will dictate when this amount is credited to your account. If you are not fully satisfied with your purchase, you may return it in accordance with Secondipity's Return Policy. Secondipity collects and remits sales tax as required by U.S. law, for transactions on Secondipity.com. If you're a tax-exempt entity, you can take advantage of tax-exempt status for purchases made on secondipity.com. For assistance with tax-exempt Secondipity.com transactions, please contact customer service at customer.service@secondipity.com. You may pay for your orders with PayPal®, Visa®, MasterCard®, American Express® and Discover® Card. Generally, credit and debit card are charged at the point of purchase. However, we may instead pre-authorize your order amount with your credit or debit card issuer at the time you place the order, which may have an effect on your available credit line. When paying for a preorder with a debit card you will be charged at the time you place your preorder. Please contact your credit card issuer for more information. You can return merchandise within 30 days of receipt by mailing the merchandise to our return center. Your only option is to receive a credit for your purchase. Please follow the instructions provided by customer care. Items returned via other means will take longer to process and freight charges will not be reimbursed by Secondipity to the customer. All property purchased via the secondipity Web site is warrantied as merchantable for a period of 30 days from the date of purchase. Secondipity expressly disclaims any additional warranties or guaranties, including fitness for a particular purpose. Secondipity is not a manufacturer or an agent or distributor of any manufacturer. Buyers should look to the product manufacturer for all additional warranties, if any. Secondipity may, at its own discretion, limit or cancel quantities purchased per person, per household or per order. Secondipity also reserves the right to reject any order you place with us. These restrictions may include orders placed by the same Secondipity Web site account, the same credit card, and orders that use the same billing and/or shipping address. In the event we make a change to an order, we will attempt to notify you by contacting the e-mail and/or billing address provided at the time the order was made. Secondipity reserves the right to limit or prohibit sales to dealers. All orders placed on this site are subject to product availability and will be shipped according to Secondipity's shipping policies. Secondipity may, in its sole discretion, terminate your account or your use of the Secondipity Web site at any time. You are personally liable for any orders that you place or charges that you incur prior to termination. Secondipity reserves the right to change, suspend or discontinue all or any aspects of the Secondipity Web site at any time without prior notice. You may only download Content displayed on the Secondipity Web site for non-commercial, personal use provided you also retain all copyright, trademark and other proprietary notices contained in the material, do not modify or alter the material and do not copy or post the material on any network computer or broadcast the material in any media. It is strictly prohibited to modify, transmit, distribute, reuse, repost, "frame" or use the content of the Secondipity Web site including the text, images, audio and/or video for public or commercial purposes without written permission from an authorized representative of Secondipity. It is strictly prohibited to download the images of the products for sale within this site. All content included on or comprising the Secondipity Web site including information, data, software, photographs, graphs, videos, typefaces, graphics, music, sounds and other material (collectively "Content") is protected by copyright, trademark, patent or other proprietary rights, and these rights are valid and protected in all forms, media and technologies existing now or developed in the future. All Content is copyrighted as a collective work under the U.S. and international copyright laws, and LSI owns, to the fullest extent allowed by such laws, the copyright in the selection, coordination, arrangement, and enhancement of all Content. The Secondipity logos and other trademarks on the site are the property of their respective owners and are owned by, licensed to, or, where required, used with permission by LSI and may not be reproduced, copied, or manipulated in any manner without the express, written approval of the trademark owner. By using the Secondipity Web site, you agree that any information (except for purchase information), materials, suggestions, ideas or comments you send to Secondipity or any other third party using the Secondipity Web site is non-confidential. By submitting any solicited or unsolicited information using the Secondipity Web site, you grant Secondipity and LSI an irrevocable and unrestricted license to use, modify, reproduce, transmit, display and distribute such materials, information, suggestions, ideas or comments for any purpose whatsoever to the extent permitted by law. The Secondipity Web site contains links to other sites operated by third-parties, including but not limited to third-party sites that display the Secondipity trademarks ("Third-Party Site(s)"). These links are available for your convenience and are intended only to enable access to these Third-Party Sites and for no other purpose. Secondipity does not warrant or make any representation about the substance, quality, functionality, accuracy, fitness for a particular purpose, merchantability or any other representation about any Third-Party Site or its content. A link to a Third-Party Site on the Secondipity Web site does not constitute sponsorship, endorsement, approval or responsibility for any Third-Party Site. 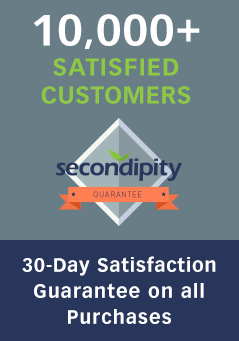 Secondipity makes no representation or warranty as to any products or services offered on any Third-Party Site. The Secondipity Web site may only be used for lawful purposes. Activities including, but not limited to, tampering with the site, misrepresenting the identity of a user, using buying agents or conducting fraudulent activities on the site are prohibited. Users are prohibited from violating or attempting to violate the security of the Secondipity Web site, including, without limitation, (a) accessing data not intended for such user or logging onto a server or an account which the user is not authorized to access; (b) using the web site for unintended purposes or trying to change the behavior of the site; (c) attempting to probe, scan or test the vulnerability of a system or network or breach security or authentication measures without proper authorization; (d) attempting to interfere with service to any user, host or network, including without limitation via means of submitting a virus to the site, overloading, "flooding," "spamming," "mailbombing" or "crashing;"; (f) forging any TCP/IP packet header or any part of the header information in any e-mail or newsgroup posting. Violations of system or network security may result in civil or criminal liability; or (g) forging communications on behalf of the Web site (impersonating the Secondipity Web site) or to the Web site (impersonating as a legitimate user). Sending unsolicited and unauthorized e-mail on behalf of Secondipity, including promotions and/or advertising of products or services, is expressly prohibited. Violations of system or network security may result in civil or criminal liability. Certain products (“Products”) that you may order or software or other materials ("Software") that you may download from the Secondipity Web site may be further subject to United States Export Controls. No Software from the Secondipity Web site may be downloaded or exported contrary to any applicable export law, including but not limited to any applicable prohibitions against download or export as follows: 1) into (or to a national or resident of) Cuba, Iran, Iraq, Libya, North Korea, Syria or any other country to which the United States has embargoed goods; or 2) anyone on the United States Treasury Department's list of Specially Designated Nationals or the U.S. Commerce Department's Table of Deny Orders. By downloading or using Software downloaded from the Secondipity Web site, you agree to abide by the applicable laws, rules and regulations — including, but not limited to the Export Administration Act and the Arms Export Control Act — and you represent and warrant that you will not transfer, by electronic transmission or otherwise, this Software to a foreign national or a foreign destination in violation of the law. Liquidity Services, Inc. is the owner and operator of the Secondipity Web site. The Secondipity Web site address is www.secondipity.com. The mailing address for Liquidity Services, Inc. is 1920 L Street, NW, Sixth Floor, Washington, DC 20036.